Driving and towing a rig isn’t as simple as driving your regular vehicle. You’re dealing with a longer, wider, taller, and heavier piece of machinery to maneuver. And mistakes can be costly. Below are some of the top insurance claims received by RV insurance providers, all easily avoided. Put this knowledge in your bag of tricks and be extra careful regarding these common rookie RV driving mistakes. 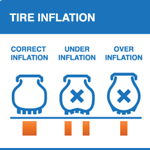 Keep tires properly inflated – not overinflated or underinflated. Check tires before trips for excessive wear or damage. For more details, download Coach-Net’s FREE RV Tire Maintenance Guide. Anything extra on your rig that you may have forgotten to retract will cause quite the headache when it hits something. Save yourself some stress and money by following a strict checklist before you go. 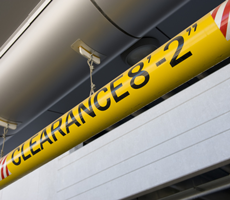 Know the height of your RV – post it on your dash if needed. Make sure you’ve also accounted for any added mirrors or awning that would increase that number. Even at campgrounds, be careful around trees and branches that could easily damage your RV roof or sides. Find a location that’s easy to get your RV in and out of. Take extra caution when turning into or away from a concrete island or pole at the gas station. Watch out for tail swings when turning away and pivot points when turning into a pole. Drive out farther than you think you need to for the turn. Also, allow for plenty of room for your pivot point and tail swing. Don’t be afraid to use a spotter to guide you – and use hand signals to communicate. When you can’t use a spotter, make sure you walk around your RV and check out the backing area to understand how much room you’ll have and how to maneuver. Stop at points regularly as you back up and always be on the lookout for pets and children. 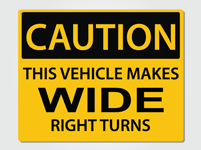 By respecting the size and maneuverability of your RV and taking certain precautions when driving, you will stay safer, which will, in turn, keep your RV safer and your insurance claims to a minimum.